Pots of flowers and other ornamental plants allow you to bring the lush greenery of your landscaping to patios and other outdoor living areas. Potted plants, whether they're flower pots sitting on a doorstep or hanging baskets on a balcony, allow you to enjoy nature where you otherwise could not. Planting pots correctly ensures that the arrangements not only look attractive, but that they are supplied with all the elements they need to thrive. Use planters and pots that have at least one drainage hole in the bottom. Drill one or more 1-inch diameter holes into the bottom of plastic and wooden pots to provide drainage if necessary. Fill pots to within 1 inch of the rim with a moist potting soil. Use a soil-less potting mixture, which contain peat, compost and other elements, as this type of mix provides optimum drainage and soil quality over the course of the gardening season. Sow the plants in the pots, spacing them at half the distance recommended on each plant's label. Choose plants that require the same amounts of water and sunlight for planting in a single pot. Plant them into the pot at the same depth they were in their nursery pots. Set the pot in an area that receives the amount of sunlight necessary for the types of plants you are growing. If you must set plants in partially shaded areas, choose areas that receive morning sun and afternoon shade when possible. Water the pots from the top until the excess moisture drains out the bottom. Outdoor pots dry quickly, so check soil moisture daily and water when the top 1-inch of soil begins to feel dry to the touch. Fertilize potted plants weekly with a quarter-strength soluble fertilizer solution, following fertilizer label application instructions. Most plants benefit from a balanced fertilizer, such as 10-10-10 nitrogen-phosphorus-potassium analysis, according to Iowa State University Extension. Remove spent flowers and dead foliage from the plants regularly. This encourages further blooming and keeps the plants at their peak appearance. Place heavy pots on wheeled garden carts to make moving them easier. 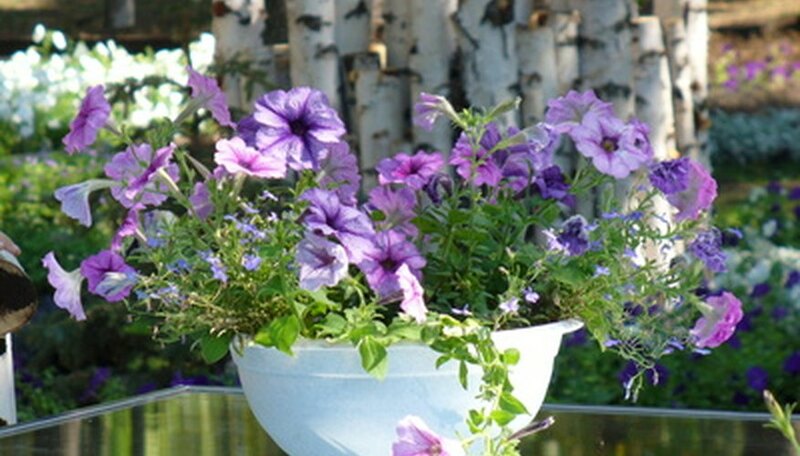 Plants may lean to one side of a pot, crowding each other, if only one side receives sunlight. Rotate the pots daily if this becomes an issue so all sides of the pot receives equal sunlight.